When I first sat down with Pokémon Art Academy over a week ago, I decided to do a little experiment. I drew the first three drawings of the game freehand on a notepad as I came across them. Then today, I tried again—and I'm truly surprised at the improvement. It's funny, as I was drawing the post-game playing images, I really thought they were just as bad as the originals. 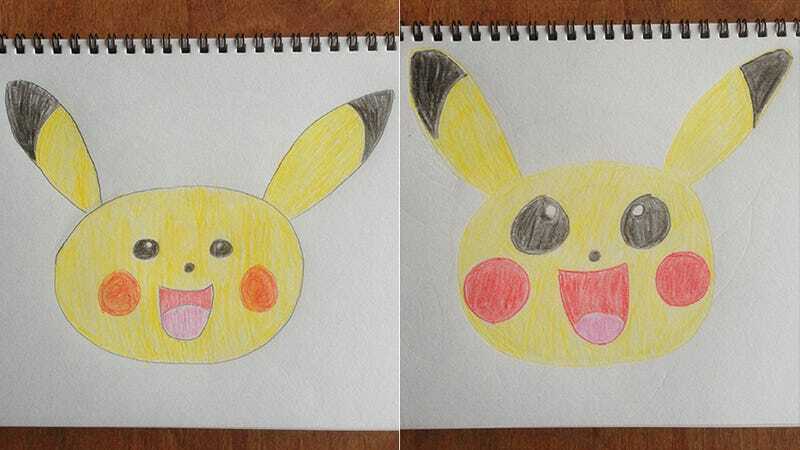 Then I compared them side-by-side and the improvement is obvious. The biggest difference is that I plainly learned the importance of inking in the newer drawings. But my shapes, proportions, and even coloring seem to have improved as well. …I still can’t draw eyes to save my life, however. Of course, a picture truly speaks a thousand words; so check out the game’s example images, my first attempts, and my second attempts below to judge for yourself.